Sorry to post this so late, but I wanted to share with you the great ideas that some of our friends and family came up with for shaloch manos (mishloach manot) this year. Breakfast or lunch foods: This year several of our friends did breakfast shaloch manos with things like cereal, juice boxes, muffins, instant coffee, creamer, etc. Outdoor/fitness: My friends Lori and Larry used a frisbee and covered it with a sports drink, a Clif bar, squeezable applesauce, and hamantashen. They even painted the outside of the frisbee with chalkboard paint and included chalk so you could draw on it! What a clever idea! 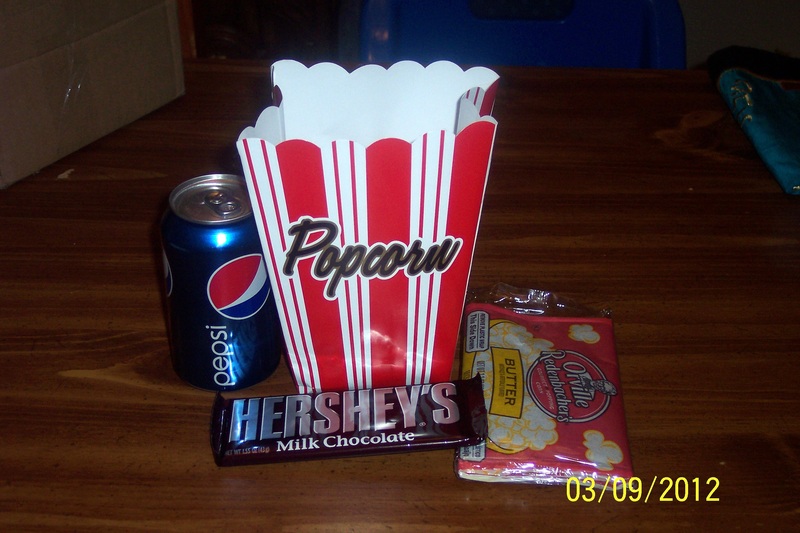 Movie night: My friend Wendy used a popcorn box and then included microwave popcorn, a can of soda and a Hershey’s chocolate bar. 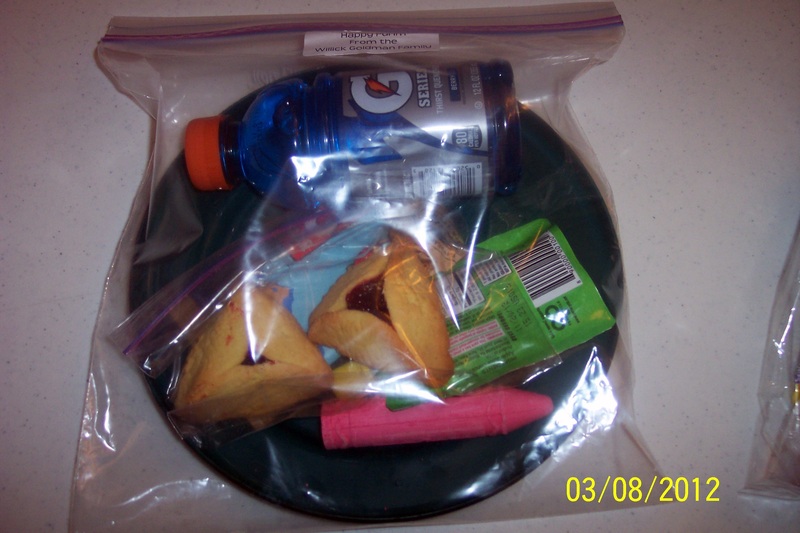 Poem: My friend Shari included a Purim poem and then included certain foods that matched words from the poem. Another set of friends, Sara and Hyim, did a similar thing with a different poem. 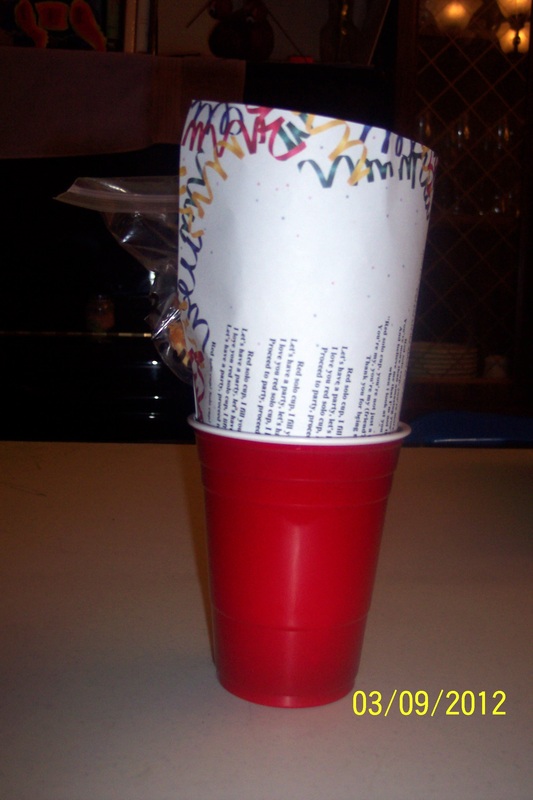 Our friends Michelle and Ephraim used the Red Solo cup song and included hamantashen, a small Rum bottle, Coke, and one other item in a red Solo cup. Food person: My friend Vicki adhered her food items together to form a man. 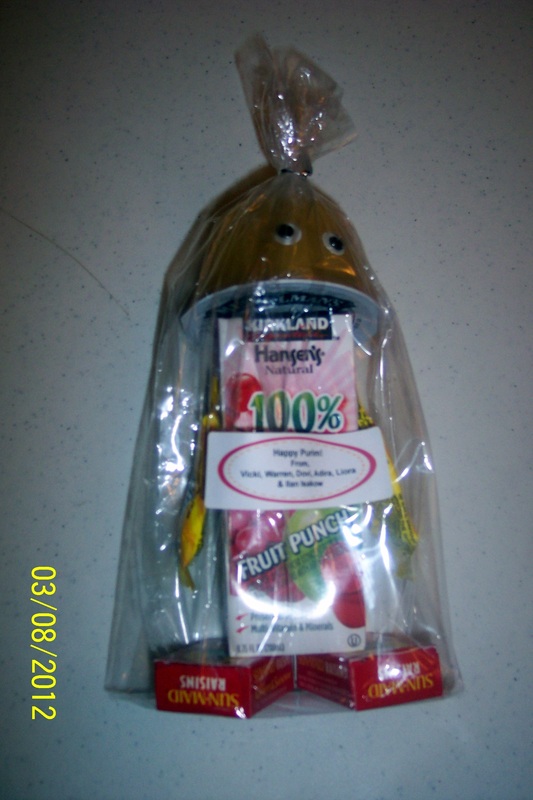 The head was a single serve applesauce, the arms – Laffy Taffy, the body – a juicebox, and the feet – boxes of raisins. The result was very cute! Our friends Bella and Yosef and Stacy and Michael always include a family picture on their labels. It makes a nice touch and I love to save them for my scrapbook. As you know, I am very conscientious about recycling and reusing. I always try to find a container or bag that can be reused. Some examples of containers I have used in the past have included: cloth drawstring bags, plastic containers (like Gladware), and soft plastic square boxes (from Garden Ridge). 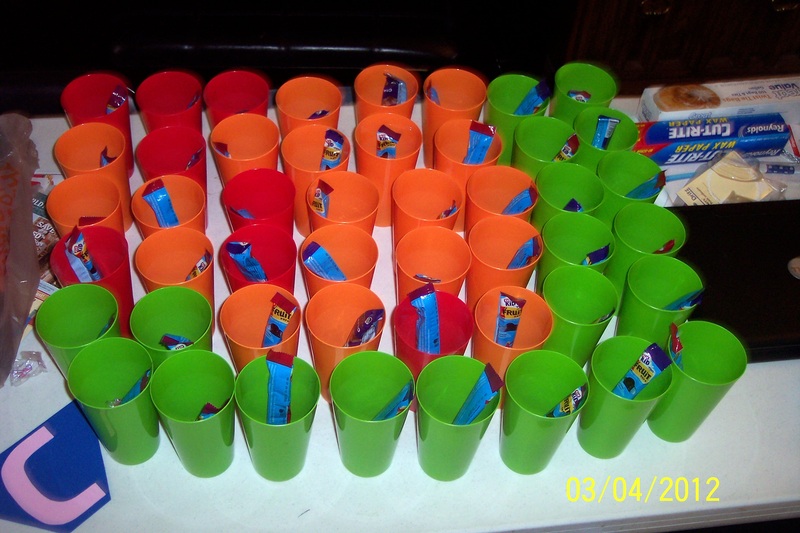 This year we used plastic cups from the dollar store. Mid-way through filling the cups. 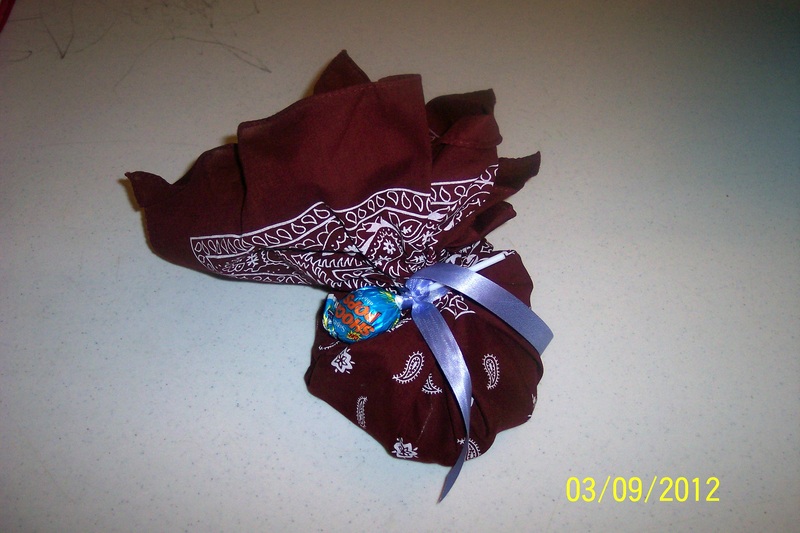 My cousin Sharone used a bandana for her shaloch manos this year. It looked great and can be reused easily! 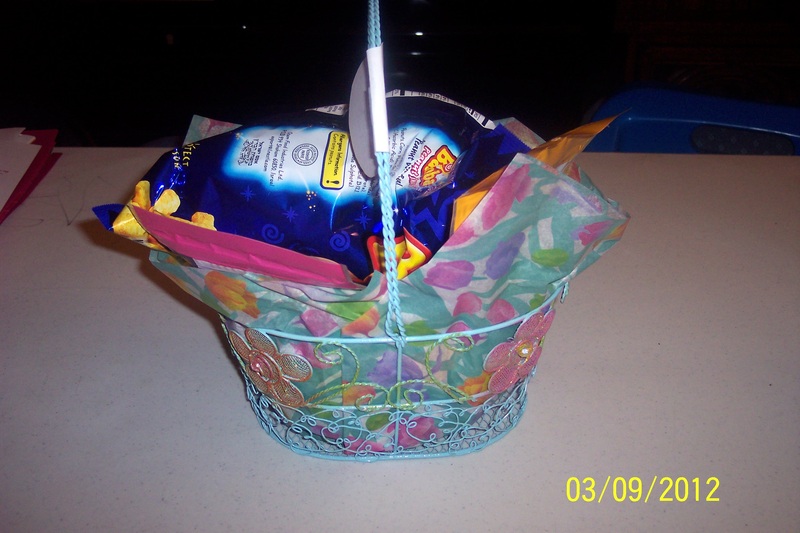 Our neighbors Charlotte and Joseph used a pretty Spring basket. I think it will look great on the table with napkins or benchers! My friend Wendy used a white paper bag. 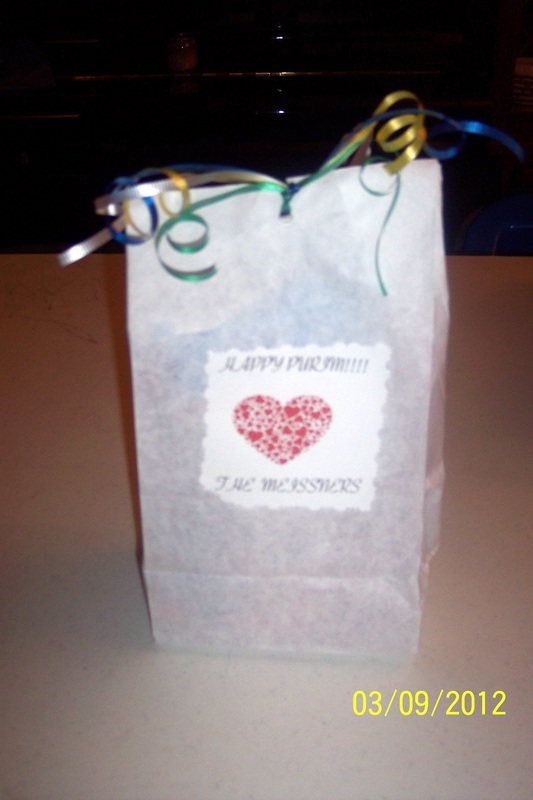 With ribbon tied at the top and a pretty label, she turned this simple container into something beautiful! I love anything I can reuse for decoration, serving food, or giving with a gift later! Please share any ideas you have seen or created in the Comments section.